As most of you know, in November 2010 I started “The Living Magick Tarot Challenge”. 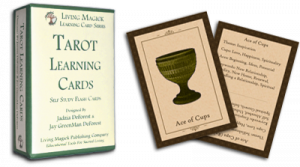 The folks at Living Magick were kind enough to send me a copy of their tarot self study flash cards, and so I decided that I would chronicle my attempt to once and for all learn the tarot with monthly updates here on The Magical Buffet. I’m pleased to say my progress has been slow but steady. About 10-15 minutes a day has me on track to eventually have a general understanding of the traditional interpretation of the tarot cards. Something that has been a long time coming. And something, thanks to my horrible memory, will be a long time to fully achieve. Recently I found myself thinking that perhaps having you all read these updates monthly might get a little boring. Of course, there was the larger realization. One that I suspect real tarot readers have known all along. I don’t think you ever stop learning the tarot. You learn all the traditional meanings and interpretations, but every time you spread the cards there is going to always be something else to learn. The way one card influences the others seems like it will be an endless learning experience. One that I’m sure will take me years to even brush the surface of. And as much as I like knowing what one article a month will be about, I don’t think I’m going to have enough entertaining or enlightening insights to warrant a monthly update for the unforeseeable future. However, I do want to say a few things before I step away from the official “Living Magick Tarot Challenge”. First, I want to say what great folks are over there at Living Magick. They are filled with enthusiasm for their work and incredibly kind for giving me their cards to play with. Second, The Living Magick tarot learning cards are just wonderful. This really is a product long over due. 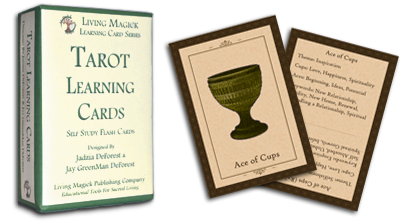 It seems like something useful for beginners like me, and even for seasoned tarot readers. If I was well versed in the tarot, I would consider the occasional run through this deck as a tarot “check up”. Perhaps a way to get a fresh perspective on the cards themselves. Lastly, as always, I want to thank all of you for reading my monthly updates! I can’t claim as to know why, but you all kept reading them, and I appreciate it!